You Save: $9.74 (75%) Ships in 1 day. Soft Cover, 176 pages, 6 x 9. 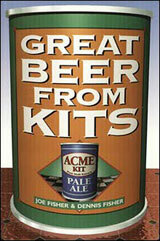 Do you want to try homebrewing but fear you will still have questions after openeing your kit? Do you already make beer from kits but want to fine-tune your brew to suit your taste? In straightforward terms this guide will steer you through the basics of kit brewing to create great beer -- the first time and every time.